Just after the allied invasion at Normandy, France, on June 6, 1944, A Mustang MKlll (FZ 190) of 19 squadron R.A.F., has landed at a BLG B-3 (2nd tactical air force) British landing ground) for repairs. The pilot, F/O F.H. 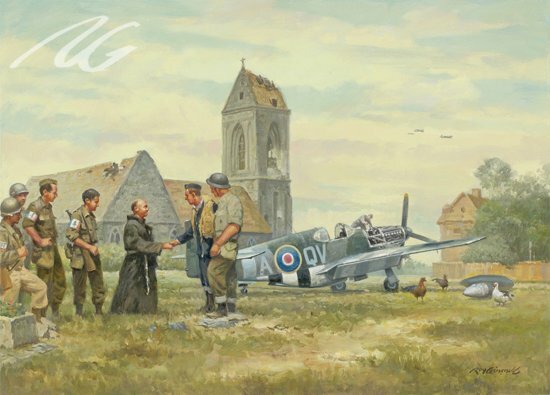 Prince is welcomed by a priest from the local church, Martragny on Saint-Croix-Sur-Mer, and free French partisan fighters. Angels were always welcomed.